Borago officinalis is used in medicine, in companion planting (tomatoes), in cooking (as spinach or with eggs) and as an oilseed. The large, hairy leaves taste of cucumber and the star-shaped blue flowers are prized for their flavour. 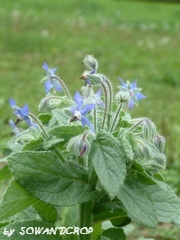 The leaves are often added to teas and salads, and the flowers have been added to wine (Borage has had a reputation to give one courage since Roman times). The flowers are highly attractive to bees. 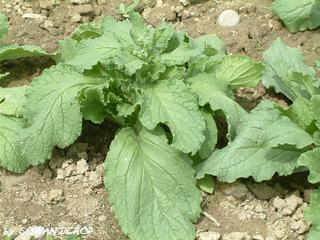 The hairs covering the plant are said to repel herbivores. Traditionally it is used in hyperactive gastrointestinal, respiratory and cardiovascular disorders (colic, cramps, diarrhea, asthma, bronchitis, cardiotonic, antihypertensive and blood purifier), urinary (diuretic and kidney/bladder disorders). Borage in companion planting protects legumes, spinach, brassicas, and even strawberries. It is good for tomatoes because it confuses the search image of the mother moths of tomato hornworms or manduca looking for a place to lay their eggs. 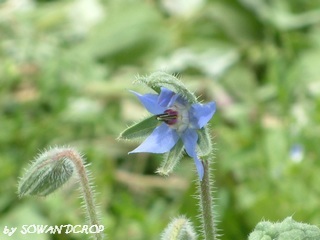 Categorie: Erbacee spontanee, Orto, Orto in cucina, Rimedi naturali | Tag: borago officinalis, borragine, companion plant, tomato | Permalink. Millepiedi a palla. Pill Millipede. Fiore femminile e fiore maschile. Differences between male and feminine flowers in Cucurbitacee. Girasole dei prati o Tarassaco.